Dominic Thiem has confirmed that Spaniard Galo Blanco will be travelling with him in 2018, sharing coaching duties with Gunter Bresnik. Blanco, who ended his four-year partnership with Russian NextGen star Karen Khachanov last month, also previously worked with Milos Raonic. Thiem, the current world No. 5, says he spent his preseason in Tenerife accompanied by Blanco, and they were on the practice courts together here in Abu Dhabi. 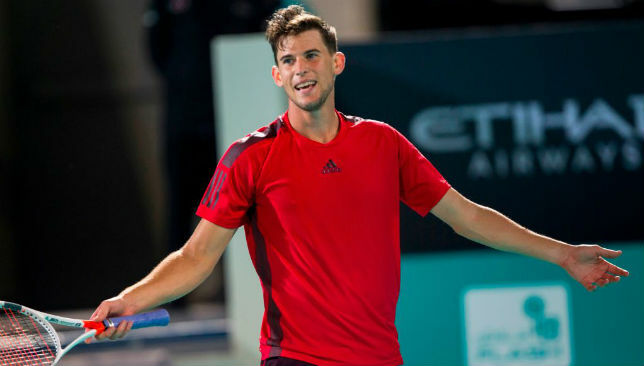 “He was already with me in Tenerife, and the tournaments where Gunter is not going, he’s going with me,” Thiem said on Saturday, after defeating Pablo Carreno Busta in straights in an exhibition match at the Mubadala World Tennis Championship. Thiem next heads to the Qatar Open where he is the top seed. Novak Djokovic pulled out of both Abu Dhabi and Doha citing elbow pain, and the ex-world No. 1 joins a host of top players who have injury question marks surrounding them. Rafael Nadal withdrew from Brisbane as he continues to recover from a knee problem, Andy Murray is in Brisbane but was far from his best during his exhibition set against Roberto Bautista Agut in Abu Dhabi, while Kei Nishikori announced he is pulling out of Sydney. With several stars struggling to get match fit, does Thiem feel there is a big opportunity for him and others looking to claim their maiden Grand Slam title in Australia? “For sure, but it’s very early in the season. We also have to step up and go in well in the tournament and start off well. Many guys who were out last year they pulled out also here or in Doha so for sure it’s more chance for us if there are less strong players,” said the 24-year-old. Thiem played two matches in Abu Dhabi, losing a tight two-setter to Kevin Anderson on Friday before defeating Carreno Busta on Saturday. He is particularly happy with how he stepped up his form compared to the end of the 2017 season, where he admits he had lost his confidence “completely” following a heartbreaking five-set defeat to Juan Martin del Potro at the US Open in September. “Compared I think to the last tournaments of the 2017 season it was a huge step forward,” said Thiem of his form in Abu Dhabi. World No. 7 Jelena Ostapenko is “excited” to face Serena Williams for the first time, the Roland Garros champion told reporters ahead of her exhibition match with the American superstar, taking place in Abu Dhabi on Saturday (17:00 local time). The Latvian youngster, who pulled off one of the biggest surprises of 2017 when she upset Simona Halep to win the French Open last June, has long admired Williams and the pair have never faced each other on tour. Williams, 36, is set to make her first appearance in almost a year. The 23-time Grand Slam champion hasn’t played a match since winning the Australian Open last January, and had her first child, Alexis Olympia, in September. “I’m really honoured to play Serena in her first match after her comeback and I think it’s such a great opportunity,” Ostapenko said at the Mubadala World Tennis Championship (MWTC) on Friday. “She was my idol when I was growing up and I really liked the style she was playing and I think she’s very big for women’s tennis. Saturday’s showdown will mark the first time a women’s tennis match is ever played at the MWTC at Zayed Sports City. Ostapenko followed her French Open breakthrough by reaching the quarter-finals at Wimbledon and ended 2017 by winning the title in Seoul — the second trophy of her career — and making semis in Wuhan and Beijing before featuring in the WTA Finals in Singapore for the first time. She’s hoping she keep her success going in 2018. “Of course it’s not going to be easy after such a great season but I prepared well and I’m just going to try and show my best at the Grand Slams and try to be in the top-10,” said the 20-year-old. Ostapenko hired David Taylor to coach her, alongside her mother, and they will next meet up in Sydney in preparation for the Australian Open. Back home in Riga, Ostapenko was treated like a megastar after her triumph in Paris. Things are tight in the WTA at the top and the No. 1 ranking can actually switch hands in the very first week of the new season, with Garbine Muguruza and Caroline Wozniacki in with a chance to replace Halep at the summit. Is getting to No. 1 a goal for Ostapenko? “I’m not actually thinking about rankings when I play. I’m just really happy when I play well, I’m going to be happy with my game not with the ranking. If I play well I think the ranking will come higher anyway,” she says. 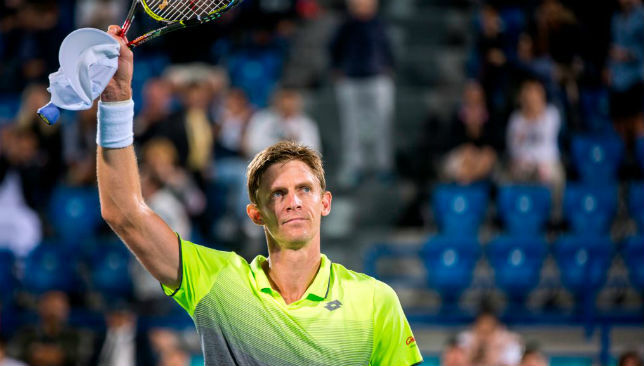 Kevin Anderson set up a Mubadala World Tennis Championship final with Roberto Bautista Agut after a hard-fought win over Dominic Thiem in the semi-finals on Friday night. The big-serving South African edged to victory in two tight sets, 7-6 (6), 6-4, to book his place in Saturday’s showpiece at the Zayed Sports City in Abu Dhabi. Bautista Agut had a free pass through to the final following Novak Djokovic’s injury withdrawal, but faced three-time Grand Slam champion Andy Murray in a one-set exhibition contest in Friday’s evening match. The Spaniard took full advantage of a rusty Murray, winning 6-2, with the Scot still on his way back to full fitness following a troublesome right hip problem. For 2017 US Open finalist Anderson, the prospect of facing Bautista Agut is an interesting one, given that the only time the two players previously met was in 2013, with the latter winning their first-round clash in Valencia 3-6, 7-6 (5), 6-3. “We haven’t played each other in quite a few years so it will be interesting to step on the court against him – a lot has changed since that match a few years ago,” the 6ft 6in star told Sport360°. Thiem has a 0-6 losing record against Anderson on tour. And, on the evidence of Friday evening, Anderson heads into the finale as favourite given the way he dismissed world No.5 Thiem, a man ranked nine spots higher than him. “It was a serve-dominated match. Dom’s got a great serve — he can hit it really firm and hard,” added Anderson, who had won all his previous six competitive meetings with the Austrian. “Midway through both the first and second sets I really felt like I found some good rhythm on his serve – I’m really pleased with that. It was good to get the early break and I served really well throughout the match. Following his exhibition win against Murray, Bautista Agut weighed up the prospect of facing the in-form 31-year-old. He said: “I’m happy with how I played the set against Andy, and on Thursday too (win over Andrey Rublev).